If you haven’t heard the news by now, you’re seriously living under a rock at the bottom of an ocean. 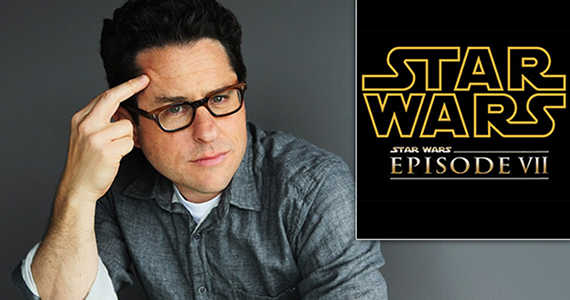 The almighty, Disney-controlled, Star Wars Episode VII finally has its director and the winner is… J.J. Abrams. Yup, the same guy who had the task of rebooting the Star Trek universe is now going to get the chance to tackle the return to Star Wars. Needless to say, this has caused mixed reactions among the geek crowds. Some are all good with it while others are screaming that Abrams isn’t the right choice. Well, it’s bloody Star Wars and there’s never going to be an agreement on who should take over, so we can leave most of the yelling and screaming where it belongs, in the Internet archives. But the question does need to be raised of whether Abrams is capable of doing this, whether you like his work or not. In my opinion, he may not be the best man, but he’s certainly in the top 10 percent. Why, you ask? Well, several reasons. First of all, he’s already shown he can tackle one major franchise with success. He took an old and tired Star Trek and gave it new life, presenting the powers that own it with new opportunities to create and expand. No longer do they need to adhere to decades of canon, always worried that one small detail will enrage the fanboys that thrive on consistency and perfection. The Star Trek property is open to new creative input. As a Star Trek fan, I am grateful for this. He will likely be able to do the same for Star Wars, albeit by setting up a new future for the franchise, not eliminating the old one. Second, he’s shown with his movie Super 8 that he knows how to appeal to kids in a non-traditional manner. Thus, we are free of the dangers of a repeat of the Jar Jar Binks situation that caused us such pain in Episode I. He’ll be able to give the franchise the needed kid-appeal without resorting to base clichés and mindless slapstick. And third, he’s worked in television long enough to know what a long-lived series like Star Wars will need in Episode VII so that all future episodes and spin-offs will not be confined by his writing. In fact, I’d venture he opens the world up so that new possibilities arise. Ultimately, that relies on the writer as well, but Abrams will have enough creative control with enough experience backing him to really set the series on solid legs for at least a decade. The biggest danger I see is that Star Wars and Star Trek may, stylistically speaking, end up looking way too similar. This may confuse new viewers, hurt marketing and limit the appeal of each franchise as it stands on its own. It will be, in my opinion, Abrams greatest challenge, to make sure this doesn’t happen. Let’s hope he can pull it off. So whether you enjoy his endless lens flares or otherwise, Abrams certainly has the skills to get the job done. I, for one, have renewed faith in Episode VII and am looking forward to seeing what Abrams brings us in 2015.